PARTY LIKE IT'S MCMXCIX. Friends, Romans, celebrants - are you sick of counting years the conventional way? Slow the chariot down and start counting the Roman way. ROMAN CANDLES are easy and fun, and doesn't "L" look a lot better than "50"? 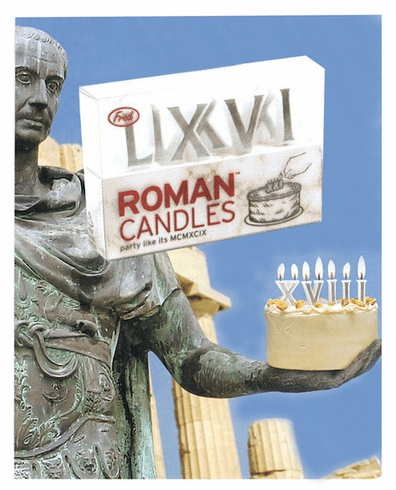 8 silver-trimmed candles in each set (good for ages 1 to 89) along with a crash course in Roman numerology.